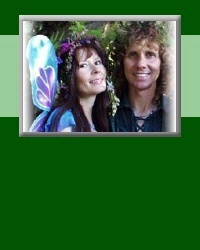 I will recommend you website to every "little fairy" that I know!!! Thanks so much again! Hi, I Just wanted to let you know that I received the fairy dress, head band and wand today! It is beautiful! I can't wait to show it to my daughter! Of course, I'll have to wait until closer to Halloween or it will be worn out before the holiday even gets her e!! Thank You so much! I am so glad that I found your website! I wanted to send you this picture of Ally in her Soft Star fairy dress (You had mentioned you would like to see it!) The only bad part of this one...she had taken off the head band. But, it's still a great little picture! Thanks again for making her Halloween special. 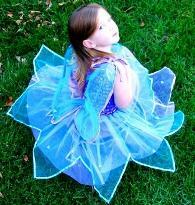 All she talked about wanting for a long time was a blue and purple fairy dress! You made her dream come true! Have a happy holiday season! 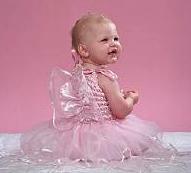 Hi, Just wanted to share with you.....this is our daughter in the pink star fairy dress we bought from you. She was 12 months old when the picture was taken. Just wanted to let you know my fairy wings arrived today and they are beautiful! Better than the picture but so true to what I expected too! 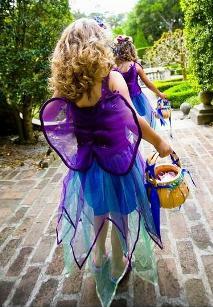 Its great to know you can expect what you see and Flower Fairy Wings better with an online order. 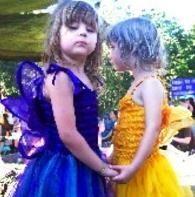 Earthstar, Love the girls "Head to toe"set of Fairy dresses they are the right color and everything.